Bruce Cooper Clarke graduated from the United States Military Academy in 1925 after entering on a National Guard appointment from his home state of New York. Seventh Army in German; and later Commander-in-Chief of the United States Army, Europe. Brigadier General Clarke established, and was the first Commandant of, what is now the Seventh Army Noncommissioned officer Academy in Germany from 1949 to 1951. He established similar academies in CONARC and in the Korean Army. General Clarke has specialized in teaching, training, and command in the Army over a great many years. He holds BS, CE, and LLB degrees. As Assistant Commandant of the Armor School, in CONARC, and later as CONARC Commander, he was closely associated with the Army school system. Clarke served with the Engineers until 1942. After period as Chief of Staff, 4th Armored Division, in November 1943, Colonel Clarke took over Combat Command A. In November 1944 ge became Commander of Combat Command B, 7th Armored Division, and soon prom to Brigadier General. During the Battle of the Bulge, the 7th Armored Division was shifted to the south. He took charge at Saint-Vith and coordinated a delaying action which helped to upset German advance and allowed the U.S. defense to be established behind him. His awards include three Bronze Stars, three Distinguished Service Medals, three Silver Stars, an Air Medal. General Clarke was buried with full military honors in Section 7-A (Grave 130) at Arlington National Cemetery. 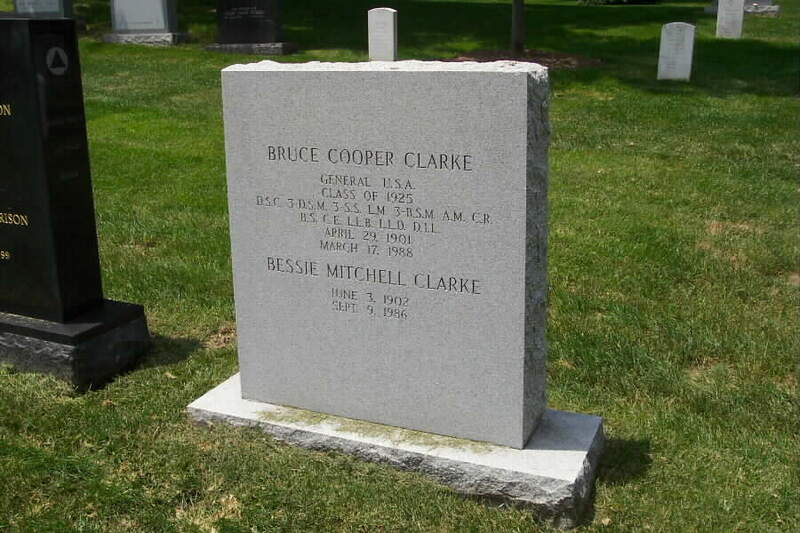 His wife, Bessie Mitchell Clarke, is buried with him. Bruce Cooper Clarke, who was born on a farm in Adams,New York, on April 29, 1901, the son of Matthew John and Isola Veneta (Stevens) Clarke, was a high school "drop-out". He quit Adams High School in 1917 to enlist as a Private in the regular army during World War I. But this high school "drop-out," ever mindful of the need for education, went back to high school after World War I ended, to continue his studies. He graduated from Masten Park High School, Buffalo, and went on to distinguish himself not only on the battlefield but also in the field of education. His many friends and former fellow students at Adams High School have followed his brilliant career up through the ranks to West Point Military Academy and on to become one of the nation's great military leaders. General Clarke may have been a high school "drop-out" but this event only served as a stepping-stone for a life-long career of learning. He not only became a soldier's teacher, but through understanding and experience a "soldier's soldier." This high school "drop-out" for one and a half years was in charge of the United States Armor School. He started and headed the Non-Commissioned Officers Academy system among U.S. occupation forces in Germany. This system later spread to the entire Army. 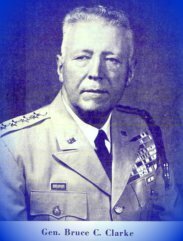 As Commander General of Continental Army Command in 1958-1960, General Clarke was head of the entire Army school system which encompassed 250.000 students. It is little wonder, then, that his friends and those who have followed his very distinguished career, have named the new Adams Center - Adams Central High School (now South Jefferson Central Senior High) building for him. General Clarke also served as Assistant Professor of Military Science and Tactics at the University of Tennessee. He holds honorary degrees from Baylor University, Parsons College and the University of Heidelberg, Germany, made him an Honorary Senator. A high school "drop-out", he was graduated from West Point with a B.S. degree; Cornell University with a degree in civil engineering; graduate of LaSalle Extension University with a L.L.B. degree; graduate of the U.S. Army Engineer school; graduate of the Armor school; and a graduate of Chemical Warfare school. General Clarke is an equivalent graduate of the National War college. Presently he is serving as Vice-Chairman of Freedoms Foundation, Valley Forge, Pennsylvania. General Clarke not only set the pace for his generation, but also has provided an inspiration to every boy and girl, including the "drop-outs" of this and future generations. Enlisting in the Regular Army at the age of 17, he served during a part of Word War I as a Private in the Coast Artillery Corps. On 5 January 1920, he joined the New York National Guard, from which he was appointed to the U. S. Military Academy at West Point. At graduation on 12 June 1925, he was granted a degree of Bachelor of Science and commissioned a second lieutenant in the Corps of Engineers. On graduation day, he married Miss Bessie Jean Mitchell of Buffalo. Lieutenant Clarke's first assignment was to the 29th Engineer Battalion (Topographic) at Fort Humphrey's, Virginia (later named Fort Bevoir). In 1927 he entered Cornell University and was graduated with the degree of Civil Engineer. Following the completion of his graduate schooling, he attended the Company Officers Course at United States Army Engineer School at Fort Humphreys. In 1930, Lieutenant Clarke was reassigned to Hawaii. He served there in the 3rd Engineers until 1932 when he returned to the mainland and was stationed with the Reserve Officers Training Corps (ROTC) unit of the University of Tennessee, Knoxville. In Addition to his military and faculty duties, he completed his studies in 1936 for Bachelor of Laws for LaSalle Extension University. Captain Clarke was reassigned to the Office of the U. S. Army District Engineer in Galveston, Texas, as Chief of the Engineering Division in 1936. In 1939 he attended the United States Army Command and General Staff school at Fort Levenworth, Kan. Upon his graduation in 1940, he was assigned to Fort Know, KY, where he organized and commanded the first U. S. armored engineer organization. With the organization of the 1st Armored Division, Captain Clarke was charged with organizing and commanding the 16th Engineer Battalion, the 1st Armored Division's Engineers. In December, 1940, he was sent to England as military observer. Upon his return in the United States, Major Clarke was assigned to organize and command the 24th Engineer Battalion of the 4th Armored Division which was being activated at Pine Camp, New York. On 24 December 1941, he was promoted to the grade of lieutenant colonel. Three weeks later, he became the Chief of Staff of the 4th Armored Division and was promoted to the grade of colonel on 1 February 1942. He served in this capacity until 1 November 1943, when he assumed command of Combat Command A of the Division. In December 1943, Colonel Clarke's combat command arrived in England. He commanded Combat Command A through the flight in Normandy and other regions of France. Colonel Clarke was reassigned to the 7th Armored Division to command Combat Command B in early November 1944. A few days later, he was promoted to the grad of Brigadier General. On June 20, he was reassigned to the 4th Armored Division as Division Commander. General Clarke was then sent to the Asiatic-Pacific Theater of Operations. After the surrender of Japan, General Clarke was reassigned to Headquarters, Army Ground Forces, in Washington, D.C., as the Assistant Deputy Chief of Staff for Plans. In a few months he became the G3 of Army Ground Forces. In early February 1948, General Clarke was reassigned to Fort Knox, KY, as the Assistant Commandant of the United States Army Armored School. At the end of the school year in 1949, General Clarke was sent to Germany where he commanded the 2nd Brigade of the United States Constabulary. Early in 1951 he returned to the United States and organized and commanded the reactivated 1st Armored Division. Later in the year he was promoted to the grade of Major General. In April 1953, General Clarke was sent to Korea to command I Corps, and on 23 June, he was promoted to Lieutenant General. In the fall, he became the commander general of X Corps to phase it out. He trained the 1st Republic of Korea Army. He was designated to Commanding General, United States Army, Pacific (USARPAC), Fort Shafter, Hawaii, in the latter part of 1954. He occupied this position until he was reassigned to Europe in 1956, to command the Seventh Army at Stuttgart, Germany. While he was the Pacific Army Commander he represented the President at the annual Coral Sea celebration in Australia. In mid-1958, he was reassigned to command the United States Continental Army Command (USCONARC) at Fort Monroe, VA, and was promoted to the rank of General. On 20 October 1960, he became the Commander in Chief, Untied States Army, Europe, and concurrently, the Commander of Central Army Group, a key NATO command. In 1961, General Clarke was honored by Baylor University at Waco, TX, with the honorary degree of Doctor of Laws. On 7 April 1962, the University of Heidelberg, Germany, conferred on General Clarke a unique honor - - - Honorary Senator of the University of Heidelberg. In June 1963, Parsons College awarded him the honorary degree of Doctor of International Law. General Clarke was made 33rd degree Mason by the Scottish Rites. The legislature of the State of New York, on 26 March 1962, passed a resolution honoring General Clarke on his service to our country over a span of about 44 years. The legislature noted that he is the only private of the National Guard of New York who had risen to the Four Star rank in the U. S. Army. On 14 April 1962, the Boy Scouts of America awarded General Clarke the Silver Buffalo, the highest award in Scouting. General Clarke concluded his active service on 30 April 1962, and on 1 May was entered on the list of retired officers in the rank of General. General and Mrs. Clarke have three sons, an adopted daughter and eleven grand-children. 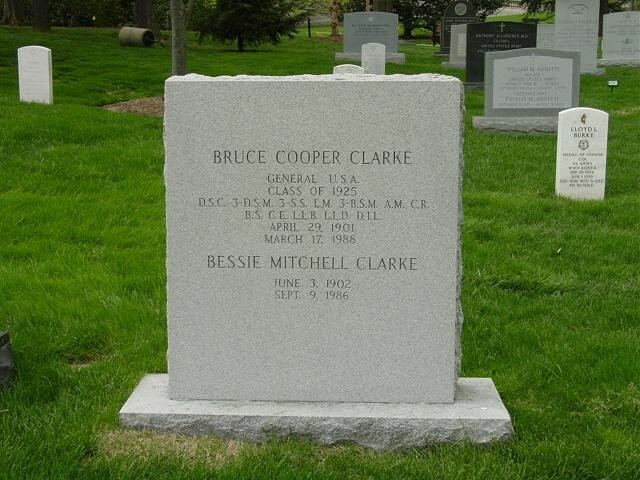 Bruce Cooper Clarke, Jr., the eldest son is a lieutenant, United States Navy Reserve. David Arthur Clarke, the second son, is a 1958 graduate of the United States Military Academy, a major in the Corps of Engineers. Their third son, Captain Gordon Mitchell Clarke, graduated from the United States Air Force Academy in 1961. Presently, Captain Clarke is also in the Corps of Engineers, U.S. Army. Their daughter, Elisabeth Jean Clarke, was taken into the Clarke family in 1951 when General Clarke was commanding the 2nd Constabulary Brigade in Germany. She is a graduate of Weshampton College of the University of Richmond, Vireginia, and married to Captain Arthur Ludlow Clark, II, United States Marine Corps. An Army wife for nearly 37 years, Mrs. Clarke has been active in community and cultural affairs in addition to her busy home life. Before her marriage, she had attended Buffalo State Teachers College. A student of piano, she taught piano for several years. In summary, perhaps the salient feature of General Clarke's career has been his varied experience in command. In over 17 years as a General officer, General Clarke has served in 14 command assignments. During his service, General Clarke has spent much time in direct contact with troop units and possibly commanded more soldiers of different nations as the field commander than any other U. S. Army Officer. Campaigns in which General Clarke took part included: Normandy, Northern France, Rhineland, Ardennes-Alsace, Third Korean Winter, Korea Summer-Fall 1953. Decorations - United States:Distinguished Service Cross, Distinguished Service Medal with 2 oak-leaf clusters, Silver Star with 2 oak-leaf clusters, Legion of Merit, Bronze Star with 2 oak-leaf clusters with "V" clasp, Air-Medical, Army Commendation Medal. Decorations - Foreign Government: Legion of Honor, France (Comdr. ); Croix de Guerre with Palm, France; Croix de Guerre with Palm, Belgium; Distinguished Service Medal with 2 Silver Stars, Korea; Meritorious Medal, Columbia; Honorary Companion of the Bath, Great Britain; Grand Cross, Order of Merit, Federal Republic of Germany; Grand Officer, Order of the Crown, Belgium, Order of Service Merit, 1st Class, Republic of Korea. Award - State of New York: Conspicuous Service Cross. Conspicuous Service Medal, Special Resolution of the Legislature of the State of New York, honoring service to the U. S.
Awards - Honorary; Silver Beaver Award, Boy Scouts of America; Silver Buffalo Award, Boy Scouts of America, Tau Beta Pi (Engineering Fraternity). Miscellaneous - Silver Anvil Award, American Public Relations Association; Minuteman Award, Reserve Officers Association; Minuteman Award, U. S. Treasury Department, Henry Know Award for Patriotism. Membership in Organizations - Boy Scouts of America: (Transatlantic Council, Past President Member, National Executive Council); Rotary: Adams, NY, honorary member: Masonic Orders: Dallas, TX, Consistory 33rd Degree; West Point Lodge No. 877 (F- AM); Kena Temple, Shrine. American Legion: Adams, NY Post, Military Order of the World Wars. Past President, United States Armor Association and Vice-Chairman of Freedoms Foundation at Valley Forge. He has been listed in Who's Who in America for 22 years. High School building in Adams, NY named for General Clarke in 1965. The decorations and awards are on display in the General Bruce C. Clarke room. There are seven flags with standards: his American flag, his Four Star General's flag, the Korean flag, U. S. Army Europe colors, IX and X Corps and 7th Army colors.